Fabla2 is an advanced sampler with multiple layers, banks, pads, integrated FX and routing. There is a range of features that make Fabla2 really powerful to use – the complexity shown here isn’t even the start of what its all capable of. Once the codebase has matured some more (its taking a long time, we know…) we’ll be keeping you up to date on progress! 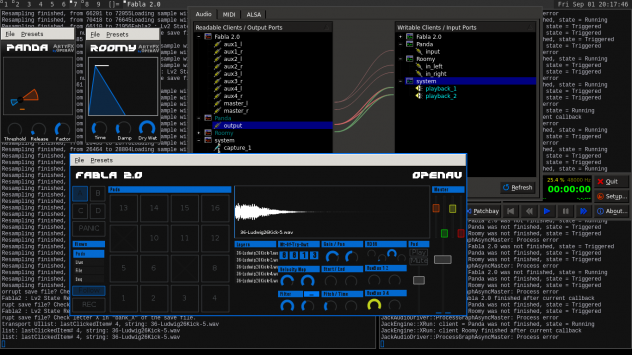 OpenAV has publicly released the source-code fro Fabla 2.0. Please note that the official “stage-ready” 2.0 release will still take some time after that. This delay ensures the quality of the plugin is to the highest standards – using Fabla2 before its official release is not recommended. The code is available at https://github.com/harryhaaren/openAV-Fabla2. Fabla2 provides much more flexibility and power in routing and effects – shown here Fabla2 using a Reverb send with AuxBus 1, and the Panda compressor running on the master mix. Believe us – the effect is both spacious in reverb and punch as hell in the kicks!